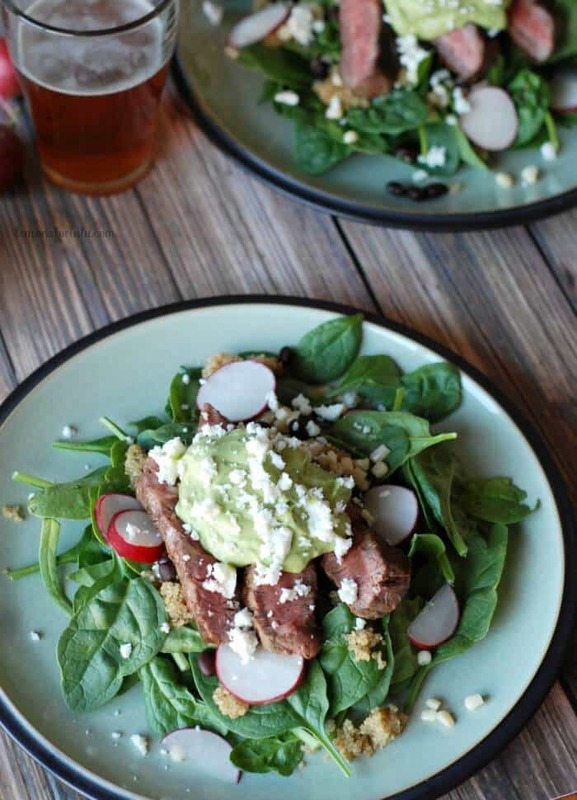 A simply seasoned steak is cooked to taste, then placed atop a spinach salad that is piled high with quinoa, corn, black beans and radishes. 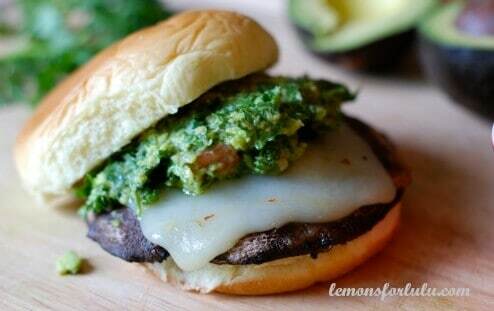 A creamy avocado dressing tops it all off! Writing my baby shower post from yesterday got me thinking about when my own kids were born. I have been reminiscing about what it was like to go from zero kids to one, then two, then three and how my parenting has changed along the way. Frankly, I’m surprised my oldest turned out as well as she did. She was our test baby, or our “training manual” if you will. We were the classic over protective, by the book parents. We (meaning me) didn’t want anyone to hold her, never left her with anyone and was selective about where I took her. She did baby enrichment classes, never ate snack food and rarely watched tv. I tried to get her to potty train early, give up her pacifier early and hoped to teach her to read early. She was by my side at all times which was why I wailed when she went off to kindergarten. My second child was different. I was very lenient with the snacks. His diet was often supplemented with goldfish and graham crackers. He was a PBS baby for sure. Curious George was a regular in our living room. I was open to the idea of others babysitting and while I still preferred to be the one to hold him, I did pass him off to others from time to time. He did classes that his sister did and had playdates with other families who had kids both his age and the age of his sister. I knew better then to try to potty train him early and while I wanted him to read early, I didn’t push it. When he went off to kindergarten, I wiped away a tear or two. Most of my rules went out the window with the third. She was allowed to watch Disney Jr. and Nick Jr. and not limited to PBS. She ate whatever she wanted. She was held by anyone who would ask and she was left with any family member eager to babysit. I didn’t even bother with potty training until it was her idea. And while I helped her walk, I wasn’t eager for her to start (she was my baby after all). She didn’t get the classes the other kids got; we didn’t have the time. She didn’t have the playdates either, she had her siblings instead. There was no need for me to sit and teach her to read. She already knew how. It seems older siblings make the best teachers. Everything is different by the time the third comes around. You are more relaxed and confident. You realize you got this. And if you don’t, that’s ok, kids have a remarkable way of turning out just fine inspite of your errors. One error I thankfully did not make is insisting the kids try different foods. 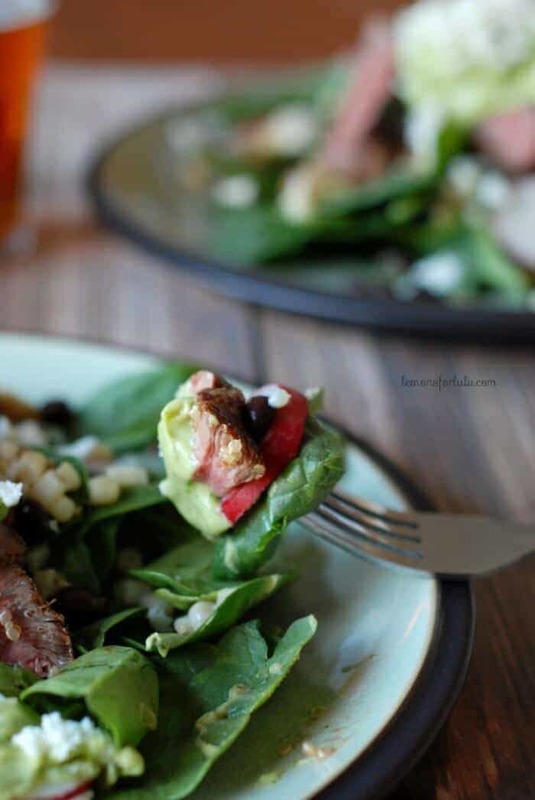 Now we can all enjoy this steak salad together with relatively few complaints! The kids even ate the quinoa and the radishes along with the black beans and corn. 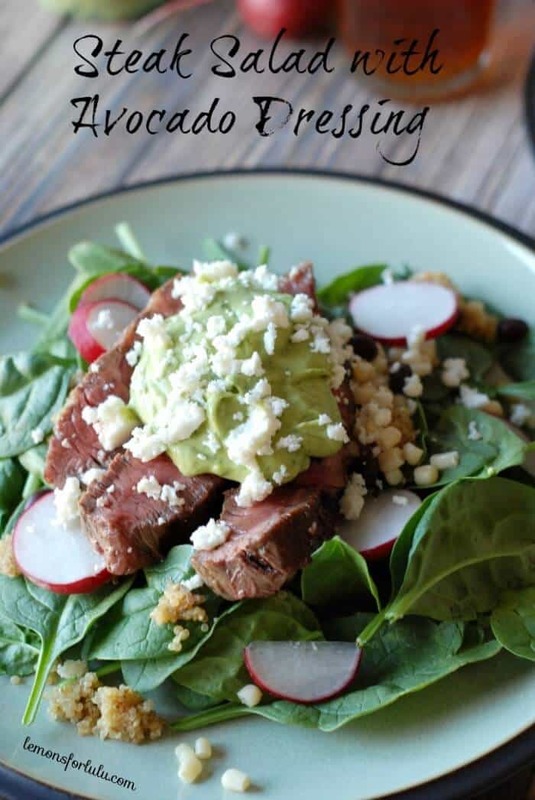 Knowing how much our family loves avocados, I knew the dressing would make every one happy. 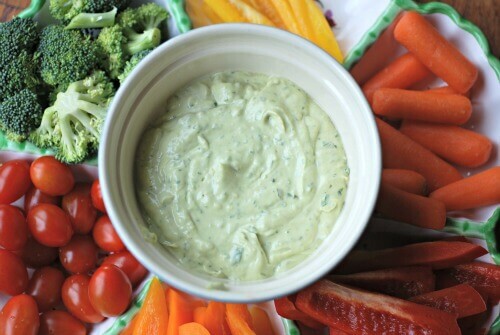 The dressing is thick and very creamy, almost like guacamole and less like a liquid dressing you are used to. 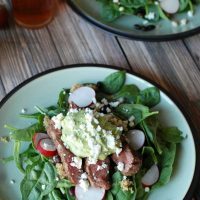 The crisp spinach, warm steak, cool radishes and creamy avocado dressing make the best mouthful! Preheat a skillet over medium heat. Sprinkle stead with salt and pepper and cook for 4 minutes on each side or until desired degree of doneness. Let steak stand before slicing. Meanwhile prepare quinoa according to package directions. Combine all dressing ingredients in a food processor or blender. Divide spinach among 4 plates. Top each with ¼ cup corn and beans. Sprinkle radishes over salad. Top salad with sliced steak. Drizzle with dressing and Queso fresco. Follow Tanya Schroeder @lemonsforlulu.com’s board Eat Your Veggies on Pinterest. I may be linking this up to these parties and to The Weekend Potluck! Oh man, if I wasn’t so full, THIS is what I would want for dinner!!! 🙂 Thanks for a great drive! Thanks for being co pilot! I’m still fasting by the way. This looks like an amazing salad! pinning it to try. found you at showstopper sat. Have a great weekend! Thank you so much for stopping over today! 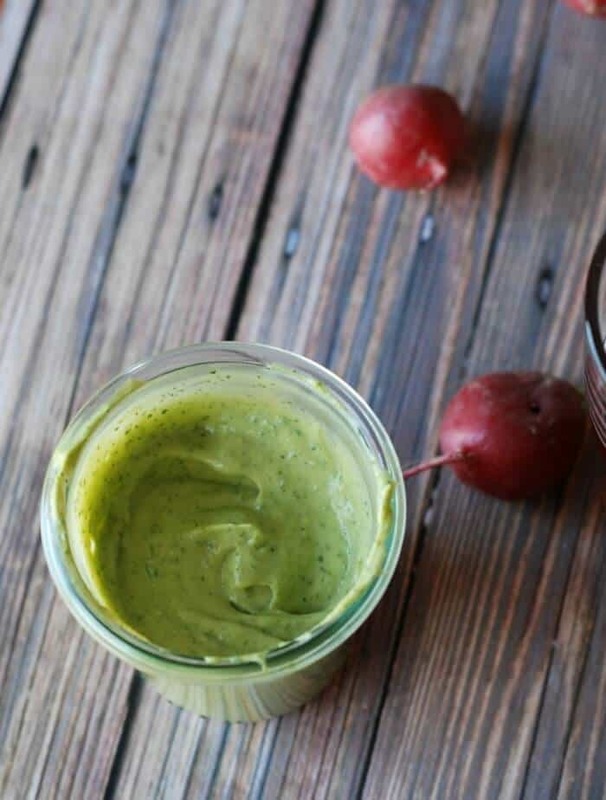 I have a homemade avocado dressing too, and it is my favorite. Creamy without being creamy! I love avocado dressing! Thank you Chrissy! I think I was the most laid back first mom ever! I’m pretty much whatever works goes! Haha! Love this springtime salad!